As the hemp industry grows, an increasing number of farmers are finding themselves in need of help combating weeds and pests. Hemp farmers typically lack soil-management expertise and pest-management options, and there aren’t many outlets they can turn to for assistance. 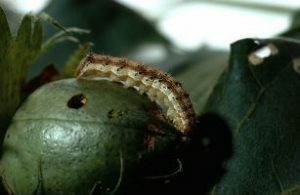 So when hemp crops are attacked by leaf-chewing corn earworms – or greenhouses suffer, say, a white mold infestation – publicly funded horticulture advisers usually know little about the crop or won’t offer assistance. And hemp growers in most places can’t use pesticides because of federal regulations. “I’ve got growers out here who are asking for help – asking, ‘What can we do?’ – when they see pests,” said Robert Pearce, a soil scientist at the University of Kentucky. The good news for hemp farmers is that pest-fighting strategies are becoming more available, ranging from using rich, healthy soil to being a stickler for cleanliness to combat things like weeds. But most important, additional help is on the horizon. Some research universities that have been slow to embrace marijuana are putting serious effort into researching hemp, a crop that is now legal to grow in 33 states. The 2014 Farm Bill authorized cultivation for research purposes and pilot programs. Hemp growers also can tap their cannabis colleagues who are cultivating marijuana. After all, hemp and marijuana are both the species Cannabis sativa and susceptible to many of the same pests and diseases. From leaf-chewing caterpillars to seed-stealing finches and microscopic organisms, plenty of visible and invisible critters can set in. The first question facing a hemp grower is where to raise the crop. There are pros and cons to growing hemp in a greenhouse or warehouse versus outdoors, and pest management is a big consideration because bugs are a problem in either environment. But while greenhouses frequently see pests drawn by heat and humidity – especially mildews and molds – outdoor hemp fields are susceptible to different bugs and even bird attacks. That means a hemp grower must be prepared for pests in either environment. Traditional farmers experimenting with hemp are often tempted to try the crop on a piece of marginal land – tucked away from public view and not the farmer’s main revenue producer. That can lead to avoidable mistakes. “It’s not a straightforward thing of just go put hemp in a field and it’ll grow,” said Tom Hutchens, director of research for Atalo Holdings, a hemp research, development and processing company in Winchester, Kentucky. Needs well-drained loam soil, so valleys or anywhere with standing water after a rain should be avoided. Gobbles nitrogen from the soil, which makes it a bad choice in an area with low nitrogen levels in the first place. Even in nitrogen-rich soil, hemp can need an additional 130 pounds per acre of nitrogen before harvest. Shouldn’t be planted where the soil might already be harboring rots or borers that also attack hemp. Researchers suggest not planting hemp on land that just held canola, edible beans, soybeans or sunflowers – all invite pests that are also known to infect hemp. As for greenhouse and warehouse hemp growers need to think about soil or growing matrix, too. Make sure not to recycle soil that might have any pathogens in it, such as gray mold (Botrytis cinereal) or white mold (Sclerotinia scleroriorum). Hemp grown indoors often suffers from the same pests that plague marijuana in warm, moist environments – powdery mildew and Botrytis cinereal, a type of fungus sometimes called gray mold or noble rot. “Dirty hoses, used pots, used (growing) media – they can all lead to some nasty outcomes in a greenhouse,” Gauthier said. Indoor growers should use a disinfectant such as quaternary ammonium chloride (brands include GreenShield or Physan 20) or even bleach to clean surfaces between every hemp crop. Even a clean crop with no visible pests or disease damage could be grown in soil harboring nasty critters biding their time. Gauthier also recommends that indoor hemp growers install foot mats treated with disinfectant and require workers and visitors to use them before entering a greenhouse. The mats help prevent employees from tracking in microscopic pests from the ground outside. Disinfecting mats are commonly used in marijuana greenhouses and should be used in hemp greenhouses, too. Farmers also can seek out hemp that can suppress weeds itself. Hemp plants that reach 12 inches tall within four weeks can help shade the soil and block weeds growing in between hemp plants. The trouble with using hemp as self-defense, though, is that farmers don’t yet know which breeds of hemp will grow so quickly at their location. Limited pesticide options mean that once bugs are visibly chewing on hemp leaves, it’s too late. “There’s nothing you can do; you have to just sit there and let your crop get eaten up,” said Burt Eure, who is working on developing hempseed at White Hat Seed Farm in Hartford, North Carolina. Companion planting of flowers and herbs can do wonders for combatting pests. There’s tons of research online and charts that tell which works for what pests. For smaller crops, there is a company called Garden’s Alive that sells natural fertilizers, etc that work great.